The 2017 New York Jets had very LOW expectations and most football “EXPERTS” believed that the Jets would finish either 0-16 or 1-15, but they OVERACHIEVED and finished 5-11. This season had some POSITIVES that they can build on for the FUTURE but they are not close to the PROMISED LAND just yet, the Jets still need to do a LOT of work to get to the Playoffs, and this season was a RIGHT first step in that direction. The Jets started out the season SLOW just like we all expected, they had LOST their first TWO games of the season, quarterback Josh McCown was not GOOD in those games and the defense RAN out of GAS in both those games. After their performance in those first two games, it looked like it was going to be IMPOSSIBLE for them to WIN a game. 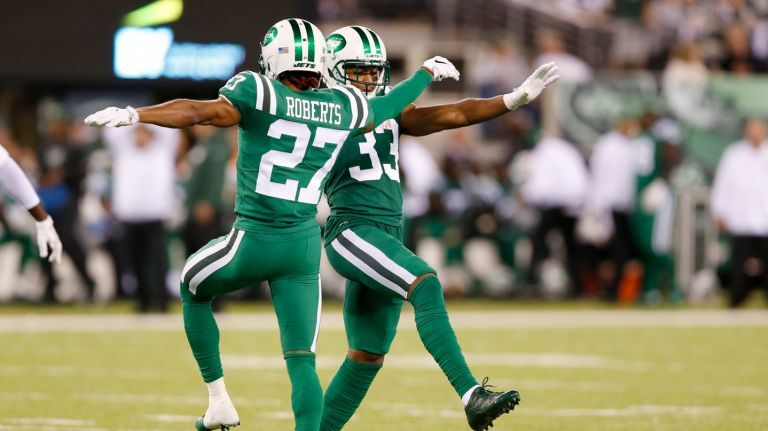 They were so bad that players on the opposing team were DANCING ON THE JETS’ GRAVES. LUCKILY for the Jets, both those games were on the ROAD and they had not been EMBARRASSED in front of their HOME crowd just yet. The Jets turned their season AROUND in Week 3 by beating the Miami Dolphins in the Jets’ HOME opener and went on a THREE game WINNING streak to exceed EXPECTATIONS for everyone. The Jets were ABOVE .500 and TIED for first place in the AFC East going into Week 6, in which they were going to face their RIVAL New England Patriots to take a LEAD in the AFC East and even jumped out to an early LEAD in that game. The Pats managed to COMEBACK in that game, but the Jets had the last glimmer of hope, but it did not end in their FAVOR. It seemed as if the Jets’ chances to be COMPETITIVE this season went away with that TOUCHDOWN, as they went on a THREE game LOSING streak following that game. Not only did the Jets LOSE those games, they had a LEAD in the FOURTH quarter in every single one of those games, which made things even more SOUR for Jets fans to swallow. The Jets took on the Bills in their ANNUAL Thursday Night Football game with their season on the LINE, and played GREAT. The Bills were one of the better teams in the AFC at the time and went on to make the plays, but the Jets BLEW them out and this time it was the Jets dancing on their opponents’ graves. It looked this season could be SALVAGED and maybe the Jets can CONTEND for the Playoffs with some WINABLE games on their schedule, but they LOST those games and the season was basically over. The problem with the Jets is that they once their fans think that the season is OVER, the Jets do exactly OPPOSITE of what their fans want them to do. They were COMPETITIVE in some games following their BYE week and even WON a game, due to a meltdown, and they RESTOCKED some hope in the minds of Jets fans like myself, who thought that maybe they could SNEAK into the Playoffs. Jets fans again started to BELIEVE in this team and that is when the team killed the HOPES of the fans ONE last time. The Jets lost their last FOUR games of the season and finished 5-11 and will be picking SIXTH overall in the NFL Draft in May. This season for the Jets was about EVALUATING the YOUNG talent on the roster and lining up some FOUNDATION pieces to build a Playoff team in the next FEW seasons. The BIGGEST foundation piece for any NFL franchise looking to build a Playoff team is finding a franchise quarterback, and the Jets LACK that piece. Josh McCown started the MAJORITY of the game this season for the Jets and he is about to turn THIRTY NINE, so he is NOT the Jets quarterback of the FUTURE. The other TWO quarterbacks on the Jets roster this season were Bryce Petty, who was not GOOD in the THREE games that he started this season, and Christian Hackenberg, who has NOT played ONE snap in his TWO seasons with the Jets. This season made it clear that the Jets do NOT have their quarterback of the FUTURE on their roster and that is their biggest need going into the OFFSEASON. The Jets’ Front Office has to make a DECISION as to how they want to find that quarterback, do they want to go the free agency route, which they have tried in the past and it has not worked GREAT aka McCown or Ryan Fitzpatrick, or they want to draft ANOTHER quarterback, which has not worked GREAT either aka Petty and Hackenberg. IF they chose to go the free agency route, there are some VIABLE options out there like Kirk Cousins and Jimmy Garoppolo, but that is going to cost a LOT of money for the Jets. Do they want to spend that much money on a quarterback or will they just want to DEVELOP a franchise quarterback in house? IF they want to develop a quarterback in house via the draft, this year’s draft class has some great options for them. Sam Darnold and Josh Rosen are at the TOP of this year’s quarterback class, but the Jets will not have an OPPORTUNITY to draft one of them at their current spot at SIX and will need to trade UP. Instead of GIVING UP pieces for Darnold or Rosen, they should just stay PUT and try their luck at quarterbacks like Lamar Jackson, Josh Allen, and Baker Mayfield. I have already made up my MIND and have been referring Mayfield as Future New York Jets quarterback Baker Mayfield over the past FEW weeks, so I will be STOKED if they draft him, but they will NOT, because the Jets do the complete OPPOSITE of what is going to please their fans. Having a franchise quarterback is not the only piece that can lead a team to the playoffs, the quarterback needs some talent on offense around him to MAXIMIZE his talent. Luckily for the Jets, they were able to to NURTURE some of that talent on offense this season. Running back Bilal Powell has turned into the Jets’ running back of the future and is one of the most UNDERRATED players in the NFL. We also saw the EMERGENCE of wide receiver Robby Anderson this season, who has the potential to be a STARTING receiver on a playoff team. Tight end Austin Seferian-Jenkins has had a ROUGH start to his NFL career, but he was able to take care of the some OFF the Field issues and looks like he can play for the Jets for many to come. Do not forget that the number ONE receiver for the Jets going into the preseason was Quincy Enunwa, who was OUT all season due to Neck injury. Enunwa should be healthy in time for next season with him the Jets have a nice CORE on offense. The Jets’ offensive line needs some work this off season to PROTECT their quarterback and give him enough time to throw the ball to his receivers. On the defense, we saw the EMERGENCE of some YOUNG talent that is going to be here for a WHILE and some talent which will NOT be here for a WHILE. The Jets have made it an yearly TRADITION to draft a defensive player in the first round of the draft the past few seasons, not all of their picks have been HOME RUNS, but their last THREE picks had GREAT seasons this year. Leonard Williams was drafted back in 2015 and though he will not be RETURNING to the Pro Bowl this season, he still had some positives this season. He was able to get his first INTERCEPTION of his career and if he continue to progress the way he has been, he is going to be one of the BEST defensive lineman in the NFL. Linebacker Darron Lee, who was drafted in 2016 and had a TERRIBLE rookie season, bounced back really well this season. He was able to SHUT DOWN many of the ELITE tight ends that the Jets played this season. Lee needs to get better in the off season but he is headed in the RIGHT direction after a GREAT 2017 season for him. Safety Jamal Adams was drafted SIXTH overall last season and he played like he was among the TOP players drafted. Adams was CONSTANTLY disrupting the opponents’ passing game and even though he did not get many interceptions, he made up for it with forced fumbles and sacks of the quarterback. Along Adams and Marcus Maye, the Jets have one of the BEST young safety tandems in the NFL, who have the potential to be GREAT. Defensive Lineman Mohammad Wilkerson was the HIGHEST paid player on the Jets but he did NOT play like it. Wilkerson was often taking plays OFF and missing meetings. He was bringing such a NEGATIVE aura to the Jets that Head Coach Todd Bowles decided to BENCH him for the last THREE games of the season and the Jets will be releasing him as EARLY as they can. The Jets are not a Playoff team right now, they need to do a lot more before we RAISE our expectations, but they are NOT that FAR as it seems. IF they are able to find that franchise quarterback and find SOME pieces on defense, then they will be in CONTENTION for the playoffs. General Manager Mike Maccagnan and Bowles need to go to WORK this offseason to justify their contract extensions, and continue to show some PROGRESS towards the playoffs. IF they FAIL to PROGRESS towards the playoffs than their jobs might be in JEOPARDY.